“Live from the Frontlines” is a feature-length documentary film project that really deserves our financial support. 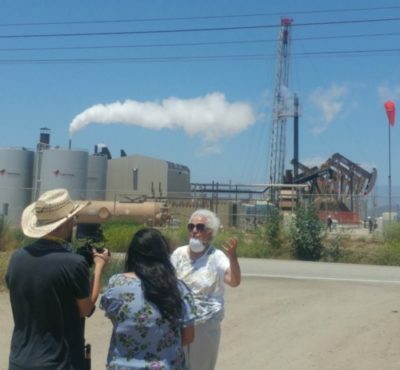 This is an ambitious and heartfelt effort to amplify the real voices of California frontline communities adversely impacted by neighborhood drilling and other forms of fossil fuel production. Interviews with community members and other vivid documentation of the harm being done will help educate local and global audiences about the life-threatening consequences of these toxic operations. The film crew is currently traveling across the state to meet with hundreds of frontline community members and organizers. They’re filming thousands of oil and gas operations jeopardizing the health and safety of nearby residents. They’re also interviewing scientists, climate wonks, elected officials, state regulators, and fossil fuel industry experts. The film will raise awareness about our fellow Californians who are being poisoned in their own backyards. And it will provide an important organizing tool for local and statewide campaigns to demands 2,500-foot setback limits around drilling sites. California is the only major oil producer in the contiguous U.S. with no setback limits or human health and safety buffer zones between oil operations and sensitive areas like homes and schools. These toxic oil operations are legally taking place an arm’s length away from where people live, learn and play. Let’s help get this film made! Please check out the website and donate what you can. From the Heart Productions is a 501(c)(3) sponsor for documentaries, so your donation will be tax deductible.